This week we will be checking out a marine reptile that has been able to tell us a LOT about how it lived and what it looked like when alive. Enter Platecarpus tympaniticus! Platecarpus was a mosasaur, a kind of prehistoric lizard that was adapted to a life in the ocean, that lived during the Cretaceous period, between 84 and 81 million years ago. It swam in shallow oceans over what is now North America, parts of Europe, and also northern Africa. At fourteen feet from snout to tail, it was large for a lizard by today's standards (biggest living example is the Komodo Dragon at ten feet) but it was tiny compared to other known species of mosasaur, some of which grew to be gigantic. The genus name, Platecarpus, translates to "Flat Wrist" in reference to the anatomy of its limbs, which were flat paddles. Like all known mosasaurs, Platecarpus was a meat-eater. 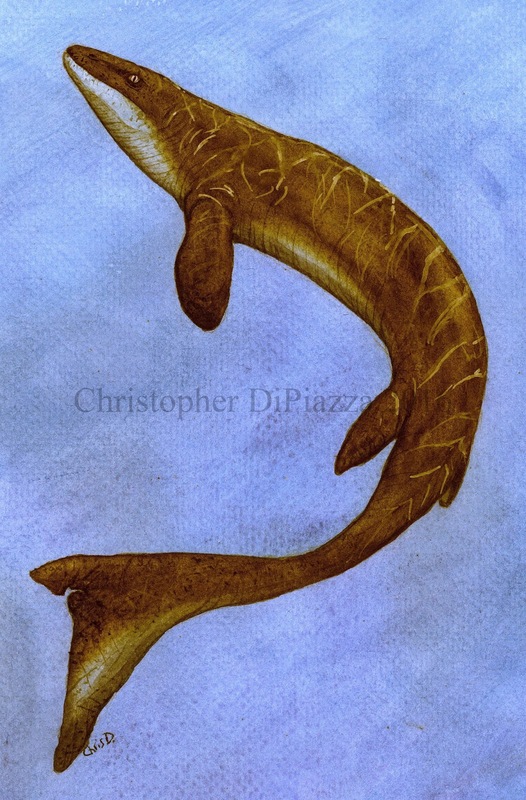 Platecarpus is a well-studied mosasaur because its fossils tend to be very common in areas where it lived. In fact, we probably know a lot of what we know about mosasaurs in general thanks to Platycarpus. There is one specimen in particular that really made the picture of this creature more clear. It was so well preserved that paleontologists could identify patches of skin, the outline of the body, its last meal, and even some of its organs! The skin of Platecarpus, according to the patches of it that preserved, was scaly, much like that of modern snakes and lizards. The scales were rounded and mosaic-like on the head, and became more like diamond-shaped shingles, overlapping slightly on most of the body. It also had small, thin scales on the throat and underbelly. This is similar to what you would find on most lizards and snakes today on a general level. The scales were also very small, so you would only be able to have really picked them out visually if you were very close to Platecarpus. This figure from the beautifully preserved Platecarpus specimen which was published in 2010 shows some of the scales, and the trachea. The organs that scientists think they may have been able to identify in the well-preserved Platecarpus specimen are the heart, liver, and kidney, based on their positions in the body. The most interesting preserved organ, however, was the trachea, the tube-like organ used to breathe air. What makes the preservation of this organ special, is that scientists could tell it was forked, and therefore would have led to two lungs inside the body. This is different from snakes, which are close relatives of mosasaurs, which typically only have one lung. Before this discovery, there were thoughts that perhaps mosasaurs only had one lung, too, to accommodate their streamlined bodies, which we now can confirm was not the case. Platecarpus' tail was tall and flattened on the sides, which would be expected for a marine animal. It was also sharply downturned towards the tip. This indicates that Platecarpus had a fluke on the top of its tail in life, similar to that of a shark. Other extinct marine reptiles, like ichthyosaurs and some kinds of crocodiles, also exhibited this same feature. Before this discovery it was assumed that mosasaurs swam similar to snakes, moving their whole bodies in S-shaped motions. Now we know their style of swimming was probably closer to that of modern crocodilians and sharks, keeping the body stiff, while powering through the water with their powerful, broad tails. Platecaarpus skull on display at the Naturmuseum Senckenberg in Germany. Note the large eyes (supported by those scleral rings) and blade-like teeth. Unlike the teeth of some larger mosasaurs, like Tylosaurus, which were pretty broad, for crushing prey, the teeth of Platecarpus were relatively flat, and blade-like. They were also serrated, to slice meat even easier. This indicates that Platecarpus was probably more adapted for hunting prey with softer bodies, like squid and certain kinds of small fish. The remains of some digested fish were also found in the well-reserved Platecarpus specimen. Platecarpus' entire skull was proportionally smaller, with a shorter snout than what is typically seen in other mosasaurs, further supporting the idea that it was better at hunting small prey. Lindgren, J.; Caldwell, M.W. ; Konishi, T.; Chiappe, L.M. (2010). Farke, Andrew Allen, ed. 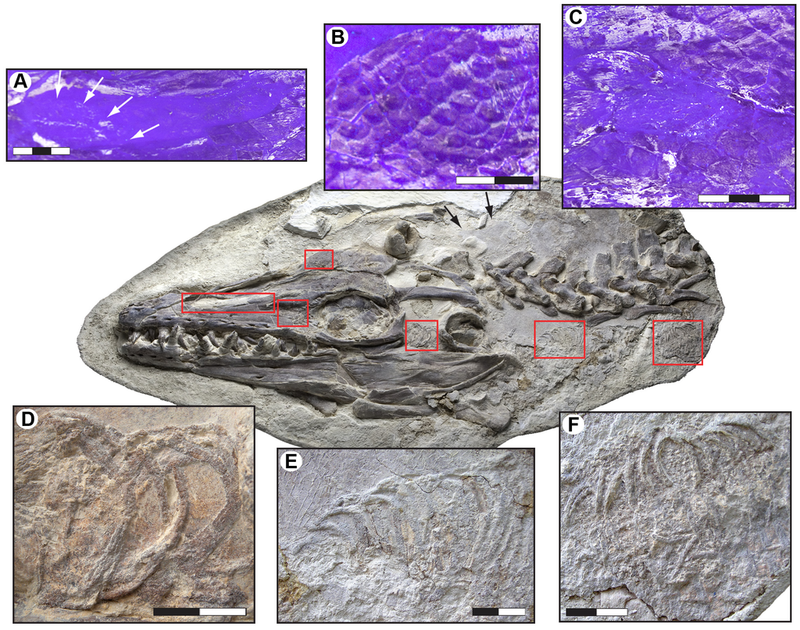 "Convergent Evolution in Aquatic Tetrapods: Insights from an Exceptional Fossil Mosasaur". PLoS ONE 5 (8): e11998. Lingham-Soliar T. 1994. The mosasaur "Angolasaurus" bocagei (Reptilia: Mosasauridae) from the Turonian of Angola re-interpreted as the earliest member of the genus Platecarpus. Palaeont. Z. 68 (1/2): 267–282.